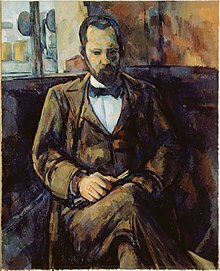 Ambroise Vollard (3 July 1866 – 21 July 1939) was one of the most important dealers in French modern art at end-19th and early twentieth century. He had his portrait painted by so many artists that Picasso said "The most beautiful woman who ever lived has never had her portrait painted, drawn, or engraved any oftener than Vollard". In most cases he bought art directly from the painters of his day. He was the first owner of Cézanne's Vue sur l'Estaque et le Chateau d'If. This sold at Christie's in London for £13,522,500 in February 1015. He sold these almost unknown artists, who became world-famous. They included Paul Cézanne, Aristide Maillol, Renoir, Louis Valtat, Pablo Picasso, André Derain, Georges Rouault, Paul Gauguin and Vincent van Gogh. He was also an avid art collector and publisher. After graduation, Vollard became a collector-dealer in art. In 1893, he started his own art gallery, at Rue Laffitte, then the center of the Parisian market for modern art. There Vollard put on his first major exhibition: Manet and others were followed by Gauguin and Van Gogh (4 – 30 June 1895). Not attractive in appearance, he was a very shrewd businessman who made a fortune. In 1930 Vollard commissioned Picasso to produce a suite of 100 etchings which became known as the Vollard Suite. Vollard would later write biographies of Cézanne (1914), Degas, and Renoir, as well as the charming Recollections of a Picture Dealer (1936). Vollard was killed in July 1939, at the age of 73, on his way to Paris, when his chauffer-driven car skidded off the road. "Are you aware of the enormity of the estate? Discoveries everywhere, valuable things, never sold nor noted, discoveries under piles of canvases, priceless, surpassing all calculation, the heirs in incredible disorder, lawsuit after lawsuit will follow". Vollard died without direct heirs. Much of the art was left to extended family and close friends, although a significant number of works apparently were sold, dispersed, or disappeared during World War II. More than 80 years after his death, works from his collection were sold after agreement with the various claimants to his estate. Massive auctions were held by Sotheby's in Paris and London in June 2010.